BANDAR SERI BEGAWAN, Jumaat, 1 Mei. - Sebanyak 105 pasukan berentap dalam Kejohanan Badminton Goldmyne Sempena Sukan Ria Antara Syarikat 2015 yang bermula hari ini di Dewan Serbaguna Jabatan Bomba dan Penyelamat, Lapangan Terbang Lama, Berakas. Kejohanan tahun ini dibahagikan kepada empat kategori iaitu Kategori ‘A’, Beregu Lelaki disertai 53 pasukan, Kategori ‘B’, Beregu Wanita 17 pasukan, Kategori ‘C’, Beregu Campuran 18 pasukan, dan Kategori ‘D’, Pasukan Campuran mengetengahkan 17 pasukan. 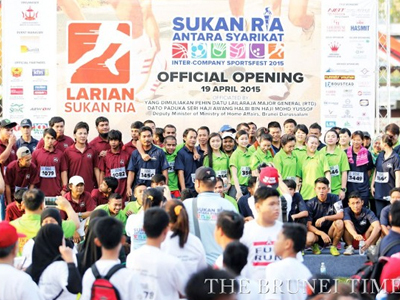 BANDAR SERI BEGAWAN - OVER 1,000 participants were on high spirits as they joined the first ever Running Challenge under Sukan Ria at Taman Haji Sir Muda Omar ‘Ali Saifuddien yesterday morning. There were three running categories: the all-men’s 8km challenge and the all-women’s 8km challenge, both open only to company employers and employees, and the 2km fun run for all members of the public. Medals and cash prizes of $400, $300 and $200- for the first, second and third places, respectively- were awarded to the winners of the men’s and women’s categories. The Inter-Company Sportsfest is back! GATHER your team mates and start training for the upcoming tournament, Sukan Ria Antara Syarikat 2015 (Inter-Company Sportsfest 2015)! Organised by the Labour Department of the Ministry of Home Affairs and managed by D’Sunlit Sdn Bhd, the one-month event will take place in April. 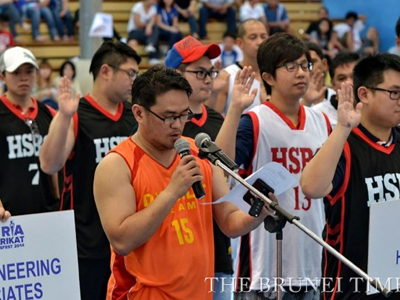 It will feature popular sports tournaments such as running, basketball, badminton, futsal, netball and bowling.Registered company employees will compete for the title of champions — cash prizes and medals are also up for grabs. 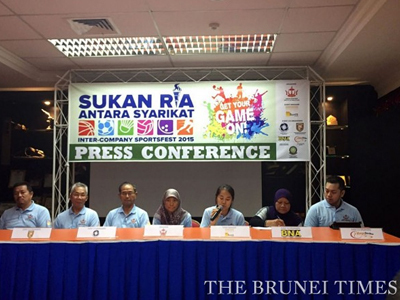 COMPANIES intending to join the running challenge or the basketball tournament of the fifth instalment of the Sukan Ria Antara Syarikat (Inter-Company Sports Fest) are reminded that the deadline for registration is on April 9. Organised by the Labour Department under the Ministry of Home Affairs and D’Sunlit Sdn Bhd as the event manager, the two categories are open to all employees under the private sector with the exception of Category A of the Running Challenge where the 2km Fun Run is open to all members of the public at no charge.